A convention of mathematics is that you don’t leave radicals in the denominator of an expression when you write it in its final form. Thus we do something called rationalizing the denominator. This convention makes collecting like terms easy, and your answers will be truly simplified. A numerator can contain a radical, but the denominator can’t. The final expression may look more complicated in its rational form, but that’s what you have to do sometimes. There are two separate situations where radicals may show up in the denominator of a fraction: where expressions contain one radical in the denominator, and where expressions contain two terms in the denominator, at least one of which is a radical. Multiply the numerator and the denominator by the same square root. Multiply the tops and multiply the bottoms and simplify. 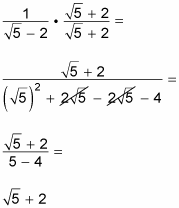 The process for rationalizing a cube root in the denominator is quite similar to that of rationalizing a square root. To get rid of a cube root in the denominator of a fraction, you must cube it. If the denominator is a cube root to the first power, for example, you multiply both the numerator and the denominator by the cube root to the 2nd power to get the cube root to the 3rd power (in the denominator). Raising a cube root to the 3rd power cancels the root — and you’re done! Multiplying a number by its conjugate is really the FOIL method in disguise. Remember from algebra that FOIL stands for first, outside, inside, and last. The middle two terms always cancel each other, and the radicals disappear. For this problem, you get x2 – 2. Multiply the numerators and denominators. Also, you can add and subtract only radicals that are like terms. This means the number inside the radical and the index (which is what tells you whether it’s a square root, a cube root, a fourth root, or whatever) are the same.